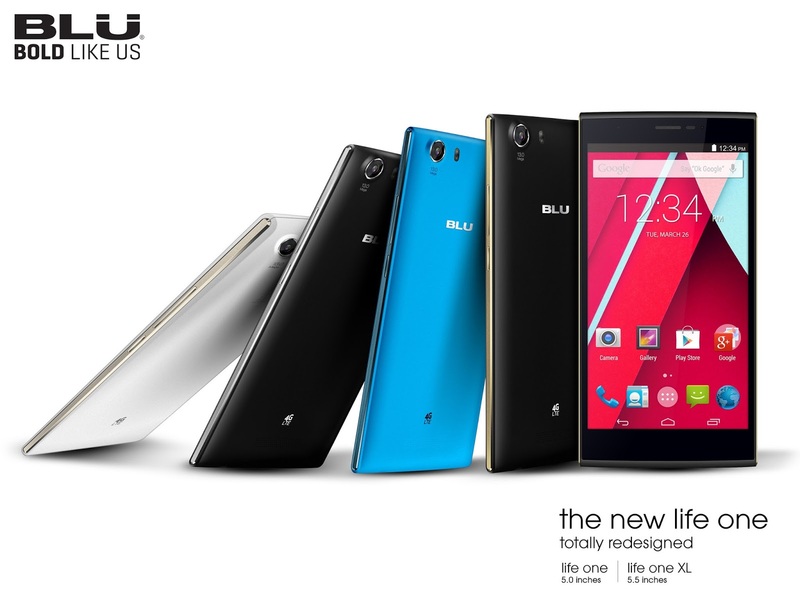 BLU presents itself as "the market leader in unlocked devices in the United States", and has announced new less than seven new Android smartphones today. The handsets come in various configurations, clearly meant to reach a wide selection of users, with a few interesting models among them. 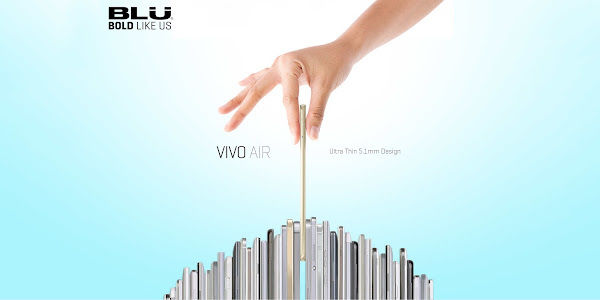 First we have the BLU Vivo Air, which is only 5.1 mm thin, making it the thinnest smartphone in North America when it arrives in mid-January. The handset features a 4.8 inch Super AMOLED display with a 720 x 1280 pixel resolution, 16GB of internal storage, an 8MP rear camera, a 5MP front camera, a 2100mAh battery and a 1.7GHz octa-core MediaTek MT6592 processor with 1GB of RAM. The BLU Vivo Air runs Android 4.4 KitKat and will be sold unlocked, for $199. 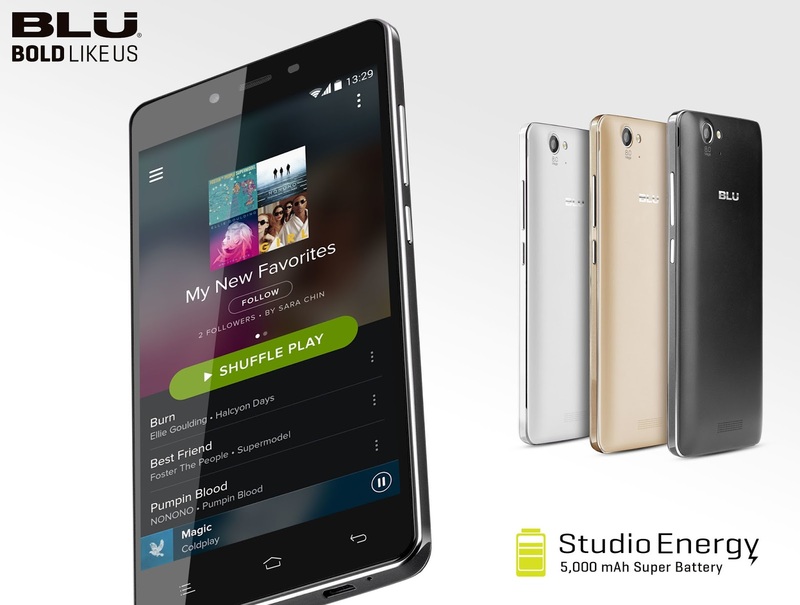 Next we have the BLU Studio Energy, which features a 5.0 inch 720p display, 8GB of internal storage which can be expanded through microSD, an 8MP rear camera, and a 1.3GHz quad-core MediaTek MT6582 processor with 1GB of RAM. The handset is outfitted with a massive 5000mAh battery which BLU claims will provide "up to 4 days" of standard use, 5 days of standby time and 52 hours of talk time. With its large battery in tow, the BLU Studio Energy measures 144.5 x 71.45 x 10.4 mm. 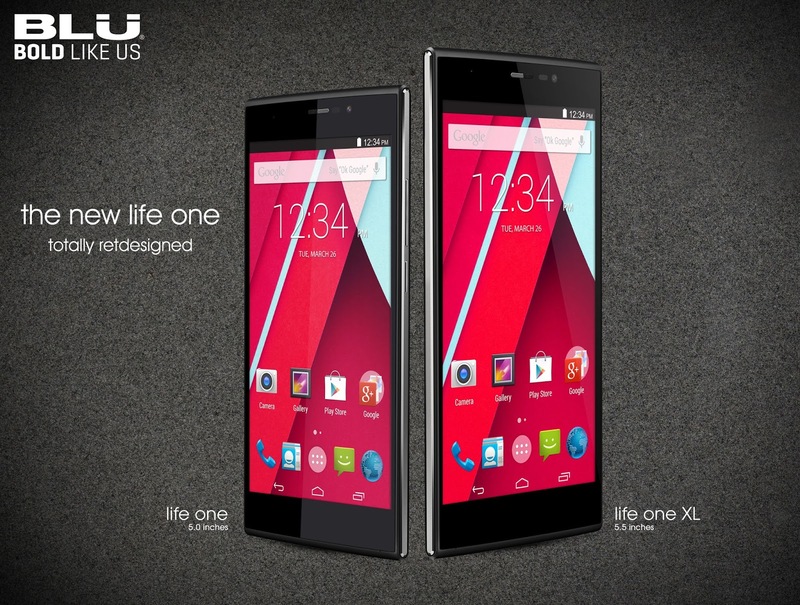 The handset runs Android 4.4 KitKat and will be released in late January with a $179 price tag. 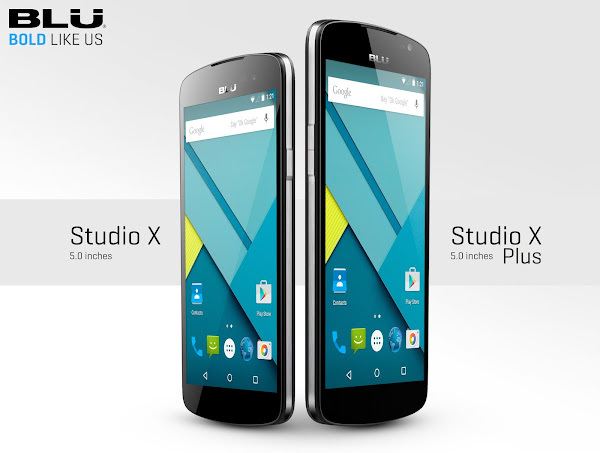 The BLU Studio X features a 5 inch 720p HD display, 8GB of internal storage which can be expanded through microSD, an 8MP rear camera and a 1.3GHz quad-core MediaTek MT6582 processor with 1GB of RAM. The handset runs Android 4.4 KitKat and is priced at $129. The BLU Studio X Plus features a slightly larger 5.5 inch 720p HD display, 8GB of internal storage which can be expanded through microSD, an 8MP rear camera and a 1.3GHz quad-core MediaTek MT6582 processor with 1GB of RAM. The handset runs Android 4.4 KitKat and is priced at $149. The BLU Studio G is a more modest device features a 5 inch display with a 480 x 854 pixel resolution, 4GB of internal storage which can be expanded through microSD, an 8MP rear camera and a 1.3GHz quad-core MediaTek MT6582 processor with 512MB of RAM. The handset runs Android 4.4 KitKat and is priced at $89. The BLU Life One features a 5 inch 720p HD display, 8GB of internal storage which can be expanded through microSD, a 13MP rear camera, 4G LTE connectivity and a 1.2GHz 64-bit quad-core Snapdragon 410 processor with 1GB of RAM. The handset runs Android 4.4 KitKat and is priced at $179. The BLU Life One XL features a 5.5 inch 720p HD display, 8GB of internal storage which can be expanded through microSD, a 13MP rear camera, 4G LTE connectivity and a 1.2GHz 64-bit quad-core Snapdragon 410 processor with 1GB of RAM. The handset runs Android 4.4 KitKat and is priced at $199. All seven handsets will be available for purchase in the US directly through Amazon and other retailers. 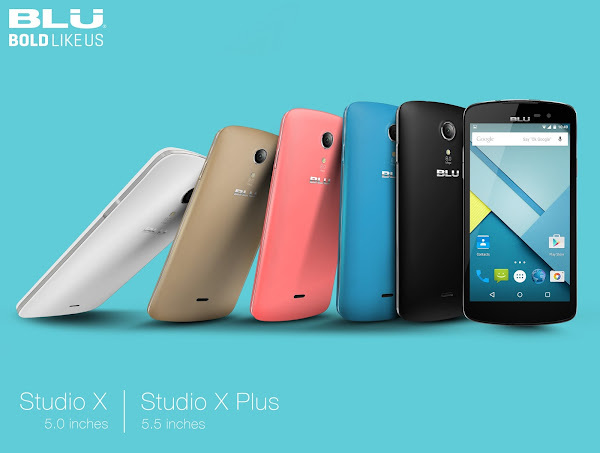 BLU has also confirmed that an Android 5.0 Lollipop update can be expected for these handsets.